Woo! First post of 2016, and the first post in far too long. I’ve really got no excuse, I just let things get away from me, and before I knew it, it’d been six bloody months since I’d posted. So, yeah, sorry about that. Anyway, to ease me back into posting, I figured I’d start with something easy that I haven’t done in quite some time. A Kickstarter project round-up! The timing works well too, because goddamn am I ever backing a lot of projects right now. For this round-up and any future ones, I’ve decided to only talk about projects that I’m 100% guaranteed to be backing, and that I’m extremely confident in the ability of the project leads to actually not only deliver their product, but to do it at a high quality, since I’ve felt a bit guilty over some previous projects that I pushed hard that ended up being very disappointing to me (not going to name names, but there’s been a few seriously shocking results). As is usual for me, most of these projects are RPGs (I tend to back RPGs or boardgames for the most part), but there’s one comic in there. Current Status: Fully funded, and smashing through the stretch goals! I’m not even sure where to begin with this one, I’m so excited! I guess a little history is in order. Kult is a Swedish RPG that was first released in 1991, though its first English edition wasn’t released until 1993. If anyone reading this remembers the Satanic Panic that certain areas of the USA had over D&D, they’ve got an idea of some of the ridiculous and unwarranted controversy that Kult had to deal with in the years following it’s release (in brief, media outlets in Sweden linked it to a number of disappearances, suicides and so on that involved people who played the game… it even got mentioned in the Swedish parliament in relation to a motion to stop tax-payer funding for youth groups that play RPGs). Controversy aside, the game was praised for its depth and handling of religious and philosophical content and ideas in a mature, if somewhat disturbing (it’s a horror game, what do you expect, puppies and rainbows), manner. The setting is our modern society, but what we perceive as our world is in fact an illusion, created by powerful being known as the Demiurge to hold humanity prisoner and stop us from regaining our divinity, while the players take on the roles of various characters from all walks of life who have started to see through the illusion and discover the stranger nature of reality. I won’t go deeper into the setting here, there’s a lot to cover and I don’t have all night, but for a decent overview of it, check out the Wikipedia page. The system had some really innovative ways of dealing with mental balance and featured magic systems based on real life mystical traditions, so it’s a pretty fascinating read. Honestly, it’s one of my favourite RPGs of all time, though I’ve rarely been able to get groups together for it. So what is KULT: Divinity Lost? 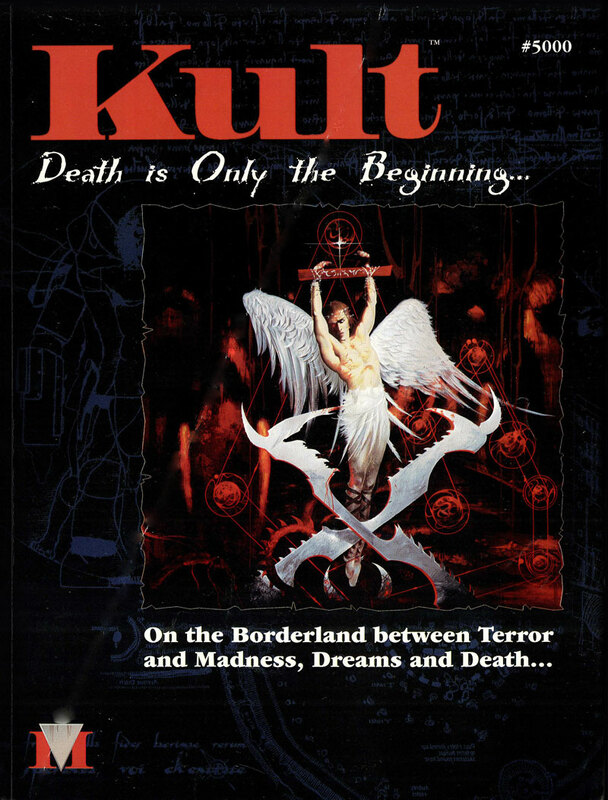 Well, this year is the 25th anniversary of the 1st edition of Kult. So for the first time since 2004, we’re getting a brand new English edition of the game. I normally um and ah over whether or not I back a project for a while after spotting one that interests me… No hesitation on this one, I’m all in. That’s not to say that I don’t have some, admittedly minor, concerns. First, the system. The old editions of Kult use a d20 resolution mechanic, though unlike standard d20 games where you’re looking to roll high, in Kult you’re looking to roll under your rating in whatever skill the check calls for. Kind of like a cross between GURPS and D&D. It was an odd system, but I know it well and I love it. This new edition is going to be Powered by the Apocalypse (PbtA), which means it uses the Apocalypse World system, but alters it to suit the themes and desired style of the game. I own quite a few PbtA games (Monsterhearts, Apocalypse World, and Urban Shadows to name a few), but have never had a chance to play any of them, so I’m not entirely sure how it’ll work for something like Kult. That said, PbtA games have regularly been critically acclaimed and won multiple awards, and the project page has some comments stating that they’re making some heavy modifications, so I’m happy that the designers have acknowledged that they need to make it fit the setting rather than making the setting fit the system. The only other thing I’m slightly hesitant about is the update to the setting. A stated goal of the project is to see what Kult would have looked like if it had been originally released in 2016 rather than the early 90s, so essentially bringing it up to speed with our current tech level and society. Not necessarily a bad thing, I just have a real fondness for the 90s feel of the original game. I’d call it nostalgia, but I was two years old when it was released, so doesn’t work so much. So, how excited am I for this game? Well, anyone who knows me knows that I tend to buy a lot of RPGs that I know I will rarely, if ever, get to play. It’s as much a hobby for me as actually playing the games are, I just enjoy reading them and mining them for ideas, and fully accept that time constraints and/or difficulty getting players means I’m not going to be able to run them. Not this time. I am running this game, by any means necessary. If that means I have to kidnap players and lock them in a room of nightmarish deathtraps just to get them to sit down and play, then so be it, I’ll go full Saw on them. People in my social groups should heed this as fair warning, lest they be surprised when they turn down an invite to a game and wake up chained to a table*. I’m not going to post any art from the comic or details of the actual story here, beyond the basic premise, because a) I haven’t asked for permission to do so, and b) I don’t want to spoil it for anyone, but I really can’t recommend Deer Editor enough. Between Ryan K. Lindsay’s snappy writing and Sami Kivela’s gorgeous artwork to carry it (no disrespect to Mr Lindsay, but no matter how good the writing for a comic/graphic novel is, without the right artwork, it’s going nowhere), it’s an utterly fantastic piece of art, and I’m really looking forward to seeing how the plot develops. If I understand correctly, Fearless picks up directly from the end of the first volume, so I’m expecting some pretty intense stuff to go down right from the start. There are a couple of caveats to note though: First up, this is a digital comic project, so you won’t get a printed copy of it at the end. However, this also means there’s no shipping costs, so yay for that! Additionally, the art is black and white, which I know is off-putting for some people. Personally I usually don’t like B&W comics that much, but in this case I find it actually works really well. Also worth noting, the book is complete, so you won’t be waiting for months after the project ends, you can read it almost straight away, and there’s no risk of the project not delivering! I’m personally backing the project for $20 (Note for international readers, this is an Australian project, so were talking AUD), because I’m a sucker for audio commentary, even if it does seem like a weird thing for a comic. But if you’re not sure and you really just want to give it a try, there’s an option to pledge for $2, which gets you the original comic as well as Fearless. And honestly, for $2, why wouldn’t you give it a go? You can’t even get a cup of coffee for that most places, and you’re being offered two comics for it. If you’re in the US, our dollar has tanked in relation to yours at the moment, so it’s even better for you! So shut up and give Ryan K. Lindsay your money! While I read a lot of comics, I don’t actually read that many superhero comics. I tend towards the weirder side of the medium, as you might have gathered from the entry right above this one. But that doesn’t mean I don’t love superheroes, I really do, I just tend to follow them in cartoon and movie form instead. I’m a particularly big fan of the X-Men, and Marvel’s mutant characters in general. If you’re wondering why that’s relevant, well, AMP: Year Three is the second expansion book for Third Eye Games superhero RPG, AMP: Year One, and it’s very much inspired by stories like the X-Men comics, with the players taking on the role of AMPs, people who have started to develop mutant abilities and have to deal with the changes this brings to their lives, as well as the hatred and fear from people who don’t understand them. I actually talked a bit about the AMP: Year Two Kickstarter project around this time last year, as well as interviewing Eloy Lasanta about the game, so it’s good to see that the game is still getting support. The original book is set in 2015, and so far it looks like the new books are going to be released on a yearly basis to keep the metaplot moving forward. Year Two covered 2016, when the AMPs became public knowledge and various factions started to seriously manoeuvre against each other. Year Three brings us into 2017, labelled as the Year of War, which I presume means there’s going to be full-blown conflict between the anti-AMP forces and the AMPs. Of course, since this is an expansion book, you’ll need AMP: Year One to play, and will probably want a copy of Year Two as well if you have any interest in the metaplot. An AMP fighting a non-mutant wearing a Resistor suit. Of course, no sourcebook for an RPG is complete without some extra character options, and as with Year Two, this new book seems to be on course to fulfil that need admirably. There’s new powers and their associated upgrades to give AMP characters (check the updates on the project page for some examples… I’m personally pretty interested in the one that lets you form a bond with a vehicle, though the bi-location one looks fun too), as well as some interesting sounding rules around corruption of mutations, allowing for more power but with added drawbacks. If you’re playing as Saps (non-mutants), their previous tech-based abilities from Year Two have been expanded with Resistor Suits, that I presume are supposed to let you go toe to toe with AMPs without their powers being an insurmountable advantage. There’s also a new character type, the Twice-Born, though that exactly this entails I’m not yet sure. System-wise, AMP runs on a variation of the Dynamic Game System that Eloy created for his other games. In this case, the variation is called DGS-Combo. I covered this system pretty well when I talked about AMP: Year Two, so I won’t go into too much detail. Basically you roll a d20, pick two skills relevant to the task at hand, add the skill ranks to your die roll, and see if you beat the target. Very flexible, and allows for some creative in game solutions as you mix and match skills. AMP powers cost Juice, a finite resource that can be recharged in various ways. Sadly I’ve yet to have a chance to play AMP, but I’m a huge fan of the setting, and really like the system. The books are well written, have an art style that works really well for the comic book style of the game, and are laid out in an easy to understand manner. The previous two books have had some minor proof-reading/editing issues, but nothing worse than I’ve seen in the majority of independently created and published RPGs I’ve read (even the big players like Pathfinder and D&D aren’t immune to those kind of mistakes). I’ve backed Eloy three times before this (AMP: Year One, AMP: Year Two and Part-Time Gods: Divine Instruments), and his projects have always run to schedule, kept regular communication open, and delivered a quality product, so I’m absolutely happy to recommend anything he’s working on. I also just noticed that Liz Chaipraditkul is working on the project as well, which makes me really happy. Liz just finished delivery for her own Kickstarter project, Witch: Fated Souls, a dark fantasy RPG. I received my copy of Witch a couple of days ago, and I’m already a big fan of it, so I look forward to seeing what Liz can bring to the world of AMP. If you’re a returning AMP enthusiast, you can pick up the book and GM screen for $25 USD. However, if you’re new to the game, there’s a pledge level for you! For $70 USD, you’ll get a softcover copy and PDF of each of the three books, as well as a GM screen and any unlocked bonus PDFs. Any books can be upgraded to hardcover for $10 USD per book, and shipping for every reward level is free, which is great for me as shipping to Australia is usually the killer for me when it comes to Kickstarters. 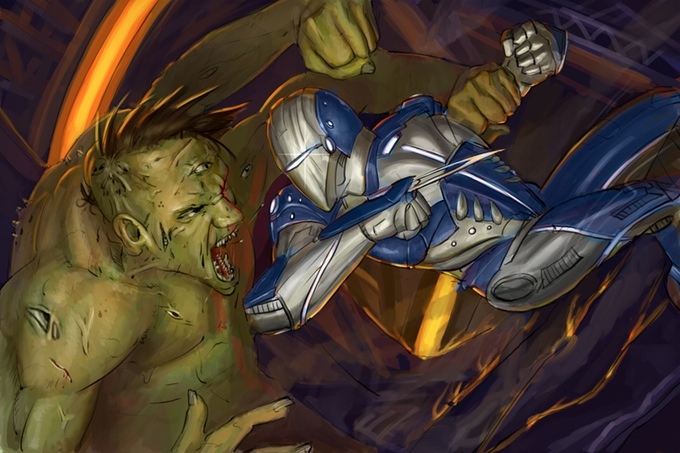 So if you like X-men style mutants and RPGs – and if you don’t like the latter, why are you even here? Did you get lost looking for a JFK conspiracy theory site? Don’t worry, you’re not the only one to make that mistake – go check out AMP: Year Three. Current Status: Fully funded and tearing its way through stretch goals… Seriously $30,000 USD goal, currently heading towards breaking the $900,000 USD stretch goal. 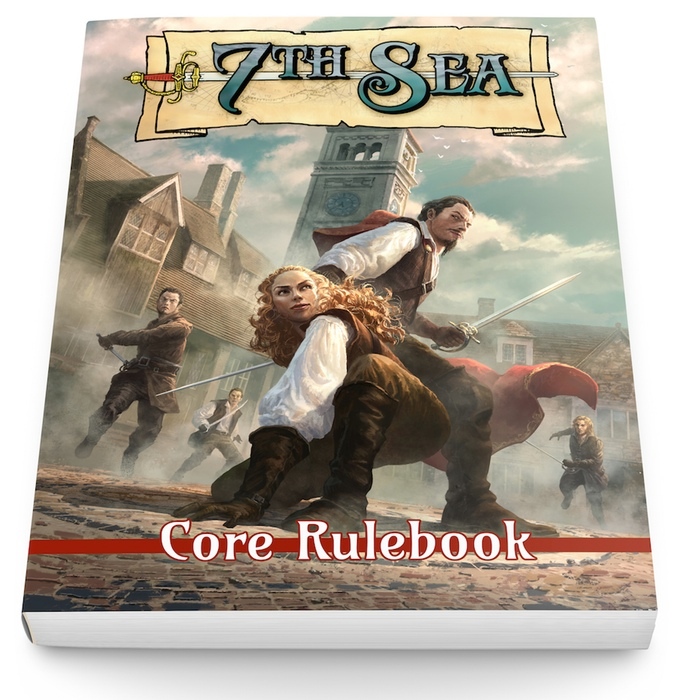 Set in the world of Théah, which is basically a fantasy version of Europe (seriously, this game is gold for anyone with an interest in European history, there’s thinly veiled stand-ins for all manner of historical figures littered throughout it), 7th Sea is a “swashbuckling and sorcery” RPG. The original version was released in 1999, though the only version I’ve ever played is the d20 one that was released late in the life cycle of the game, which I’m told is far inferior. So I’m not familiar with the game mechanics as they initially existed, and I’ve yet to get a real understanding of the new mechanics (which I believe are just a tightened up and revised version of the original system), but based on setting alone I’d be willing to recommend this to people. Doesn’t matter what system you want to use it with, if you want a fantastically designed fantasy version of Europe in the 1600s, with complex politics, bizarre magic systems that are almost unique to their own countries, and a fantastic cast of NPCs (Captain Reis is one of my favourites from any game), this is a solid investment. The project page lists the stories of Dumas (The Three Musketeers, The Count of Monte Christo, and so on), as well as The Princess Bride as inspiration, and it really shows, though interestingly much of the background of the sorcery elements of the game feel distinctly Lovecraftian… A word of advice to anyone playing as a Montaigne Porte sorcerer… Whatever you do, do not open your eyes while you’re travelling through a portal! And you should probably ignore any pleasant voices promising you wonderful things if you do open your eyes while you’re at it. The designer in charge of this new edition is John Wick, one of the creators of the original game. I may not be a fan of all of his work, but it’s undeniable that the man knows his design work, and always puts out a top notch quality product. He’s been writing for years for various companies, as well as releasing his own independent games, and has previously completed six Kickstarter projects, none of which I’ve heard anything bad about. I’d talk more about 7th Sea and try to explain the setting some more, but honestly I don’t think I can do it justice the same way John can, so all I’ll say is that you should go take a look at the project page, where there’s plenty of info available about the core book, system and setting, as well as details of the many new areas that have been unlocked as stretch goals. Written while listening to Blue Stahli’s latest album, The Devil. If you’re a fan of Industrial Electronica, I highly recommend checking it out. Has a very different feel to his previous vocal album, the focus here is more on thumping, rocking songs that catch the ear and get you singing along than the previous albums complex lyrics woven into the songs, but there’s still that madcap experimental feel to it, like he’s just throwing everything at the wall and somehow making it all stick. And the lyrics are still excellent, it’s just a different feel, though the song Enemy is easily the closest to his self-titled album in style. The album is on Spotify, so I presume it’s on most other streaming services as well. I’ll try to have another post up soon, I’ve certainly got enough fodder to write about at the moment. I’m running the first session of a cyberpunk game using the Interface Zero setting for Savage Worlds on Monday night, and am currently planning a series of two or three session games of a number of various systems to find a game or two I’d like to run on a long-term basis. I’ll also be reviewing Josh Vogt’s latest novel a little closer to its release date early in April, and when I have time I’ll be writing a review of Witch: Fated Souls and interviewing the designer, Liz Chaipraditkul. This entry was posted in General Updates, Role-playing and tagged 7th Sea, AMP, AMP: Year Three, comics, Deer Editor, Eloy Lasanta, John Wick, Kickstarter, Kult, KULT: Divinity Lost, Role Playing Game, RPG, Ryan K. Lindsay, Third Eye Games. Bookmark the permalink.